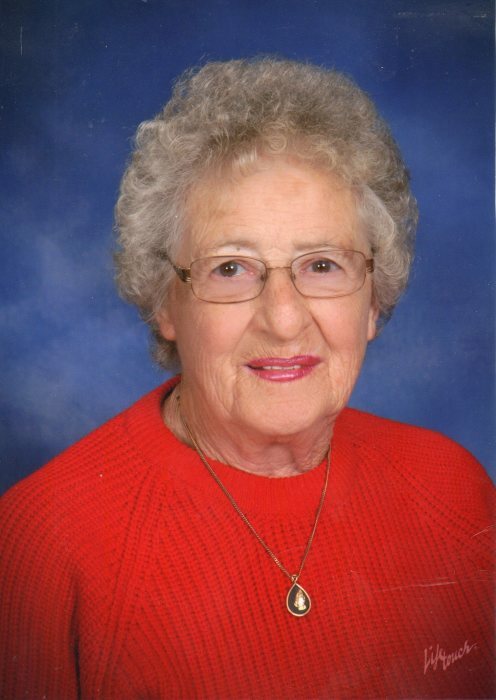 Ruth Arlene Hopson, 91, of Carthage, Illinois, passed away at 8:00 A.M. Monday morning, November 12, 2018 at Memorial Hospital in Carthage, Illinois. Ruth was born June 30, 1927, the daughter of Roy and Callie (Hainline) Sly in Emmett, Illinois. On November 9, 1946, she was united in marriage to Harvey Duane Hopson at the United Methodist Church in Quincy. He preceded her in death in 2010. Ruth helped Harvey at the Denver Elevator, which he managed, and later worked as a bookkeeper for the Southeastern School District for 20 years. She was a member of the First United Methodist Church in Carthage, a member of the Order of Eastern Star Browning Chapter of Denver and a dual member of the Grace Chapter in Carthage. She was also a member of the V.F.W., American Legion, and Memorial Hospital Auxiliaries. She enjoyed volunteering at Memorial Hospital in Carthage for several years. Ruth was an excellent cook and was especially known for her homemade angel food cakes. Ruth is survived by her daughter, Jessie Fifer, of Carthage; two sons, Wayne (Vickie) Hopson of Dublin, Ohio and Leland (Lysa) Hopson of Angel Fire, New Mexico; seven grandchildren, Holly (Kalib) Lucas, Angela Westerfield, Brian (Kelly) Hopson, Eric Hopson, David Hopson, Michael Salamon and Megan Cotanch; four great grandchildren, Colton and Chase Westerfield and Annabelle and Parker Hopson; also one brother-in-law, Virgil Steinkamp and many nieces, nephews and cousins. She was preceded in death by her parents; her husband, Harvey; and eight brothers and sisters, William Sly, Duane Sly, Marvel Harrison Webster, Janet Skinner, Peggy Steinkamp, Luan Richardson, Wanda Nichols and James Sly. Funeral services will be held at 10:00 A.M. Friday morning, November 16, 2018, at Printy Funeral Home in Carthage with burial to follow in the West Point Cemetery in West Point, Illinois. Visitation will be held Thursday evening from 3:00 – 7:00 P.M. with family meeting friends from 5:00 – 7:00 p.m. An Order of Eastern Star service will be held at 7:00 P.M. Thursday evening following the visitation at the funeral home. Memorials may be directed to H.U.G.S. in Hancock County or the Memorial Hospital Foundation. Printy Funeral Home of Carthage is in charge of arrangements.